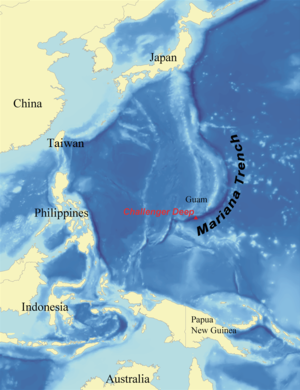 The Mariana Trench or Marianas Trench is the deepest pairt o the warld's oceans. It is locatit in the wastren Paceefic Ocean, tae the east o the Mariana Islands. The trench is aboot 2,550 kilometres (1,580 mi) lang but haes an average width o anly 69 kilometres (43 mi). It reaches a maximum-kent depth o 10,994 m (± 40 m) or 6.831 mi (36,070 ± 131 ft) at the Challenger Deep, a smaw slot-shaped valley in its fluir, at its soothren end, althou some unrepeatit measurements place the deepest portion at 11.03 kilometres (6.85 mi). This page wis last eeditit on 17 Juin 2015, at 20:56.